Traditional Chinese porcelain tea service includes individual Gaiwan tea cups. Tea is infused in the teacup. When ready the lid and cup are held in one hand. The lid is held in place to contain the tea leaves while the tea is sipped from the cup. 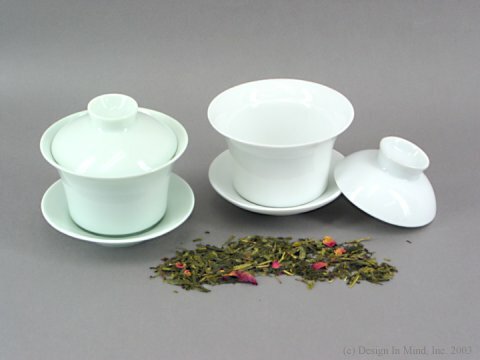 Attractive porcelain gaiwan in celedon green or white includes cup, lid, and saucer. Holds 2 to 3 ounces with tea.